Researchers and engineers have long sought ways to conceal objects by manipulating how light interacts with them. A new study offers the first demonstration of invisibility cloaking based on the manipulation of the frequency (color) of light waves as they pass through an object, a fundamentally new approach that overcomes critical shortcomings of existing cloaking technologies. The approach could be applicable to securing data transmitted over fiber optic lines and also help improve technologies for sensing, telecommunications and information processing, researchers say. The concept, theoretically, could be extended to make 3-D objects invisible from all directions; a significant step in the development of practical invisibility cloaking technologies. Most current cloaking devices can fully conceal the object of interest only when the object is illuminated with just one color of light. However, sunlight and most other light sources are broadband, meaning that they contain many colors. The new device, called a spectral invisibility cloak, is designed to completely hide arbitrary objects under broadband illumination. The spectral cloak operates by selectively transferring energy from certain colors of the light wave to other colors. After the wave has passed through the object, the device restores the light to its original state. Researchers demonstrate the new approach in Optica, The Optical Society's journal for high impact research. "Our work represents a breakthrough in the quest for invisibility cloaking," said José Azaña, National Institute of Scientific Research (INRS), Montréal, Canada. "We have made a target object fully invisible to observation under realistic broadband illumination by propagating the illumination wave through the object with no detectable distortion, exactly as if the object and cloak were not present." When viewing an object, what you are really seeing is the way in which the object modifies the energy of the light waves that interact with it. Most solutions for invisibility cloaking involve altering the paths that light follows so that waves propagate around, rather than through, an object. Other approaches, called "temporal cloaking," tamper with the propagation speed of the light such that the object is temporarily concealed as it passes through the light beam during a prescribed length of time. In either approach, different colors of an incoming light wave must follow different paths as they travel through the cloaking device, thus taking different amounts of time to reach their destination. This alteration of the wave's temporal profile can make it apparent to observers that something is not as it should be. "Conventional cloaking solutions rely on altering the propagation path of the illumination around the object to be concealed; this way, different colors take different amounts of time to traverse the cloak, resulting in easily detectable distortion that gives away the presence of the cloak," said Luis Romero Cortés, National Institute of Scientific Research (INRS). "Our proposed solution avoids this problem by allowing the wave to propagate through the target object, rather than around it, while still avoiding any interaction between the wave and the object." Azaña and his team accomplished this by developing a method to rearrange different colors of broadband light so that the light wave propagates through the object without actually "seeing" it. To do this, the cloaking device first shifts the colors toward regions of the spectrum that will not be affected by propagation through the object. For example, if the object reflects green light, then light in the green portion of the spectrum might be shifted to blue so that there would be no green light for it to reflect. Then, once the wave has cleared the object, the cloaking device reverses the shift, reconstructing the wave in its original state. 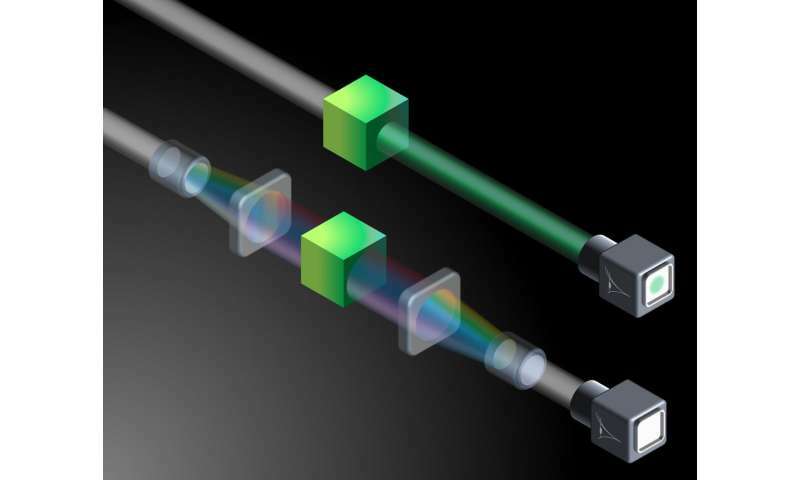 The team demonstrated their approach by concealing an optical filter, which is a device that absorbs light in a prescribed set of colors while allowing other colors of light to pass through, that they illuminated with a short pulse of laser light. The cloaking device was constructed from two pairs of two commercially available electro-optical components. The first component is a dispersive optical fiber, which forces the different colors of a broadband wave to travel at different speeds. The second is a temporal phase modulator, which modifies the optical frequency of light depending on when the wave passes through the device. One pair of these components was placed in front of the optical filter while the other pair was placed behind it. The experiment confirmed that the device was able to transform the light waves in the range of frequencies that would have been absorbed by the optical filter, then completely reverse the process as the light wave exited the filter on the other side, making it look as though the laser pulse had propagated through a non-absorbing medium. While the new design would need further development before it could be translated into a Harry Potter-style, wearable invisibility cloak, the demonstrated spectral cloaking device could be useful for a range of security goals. For example, current telecommunication systems use broadband waves as data signals to transfer and process information. Spectral cloaking could be used to selectively determine which operations are applied to a light wave and which are "made invisible" to it over certain periods of time. This could prevent an eavesdropper from gathering information by probing a fiber optic network with broadband light. The overall concept of reversible, user-defined spectral energy redistribution could also find applications beyond invisibility cloaking. For example, selectively removing and subsequently reinstating colors in the broadband waves that are used as telecommunication data signals could allow more data to be transmitted over a given link, helping to alleviate logjams as data demands continue to grow. Or, the technique could be used to minimize some key problems in today's broadband telecommunication links, for example by reorganizing the signal energy spectrum to make it less vulnerable to dispersion, nonlinear phenomena and other undesired effects that impair data signals. While the researchers demonstrated spectral cloaking when the object was illuminated from only one spatial direction, Azaña said it should be possible to extend the concept to make an object invisible under illumination from every direction. The team plans to continue their research toward this goal. In the meantime, the team is also working to advance practical applications for single-direction spectral cloaking in one-dimensional wave systems, such as for fiber optics based applications. More information: L. Romero Cortés, M. Seghilani, R. Maram, J. Azaña, "Full-field broadband invisibility through reversible wave frequency-spectrum control," Optica, 5, 779-786 (2018). While this might produce invisibility to the human eye, doesn't any cloaking concept using a projected light source have the disadvantage of the projected light source being detectable to the suitable detection equipment of those that know this technology exists and that are seeking the projected cloaking light? And once we can do this we can make invisible jet aircraft. A decisive tactical advantage.